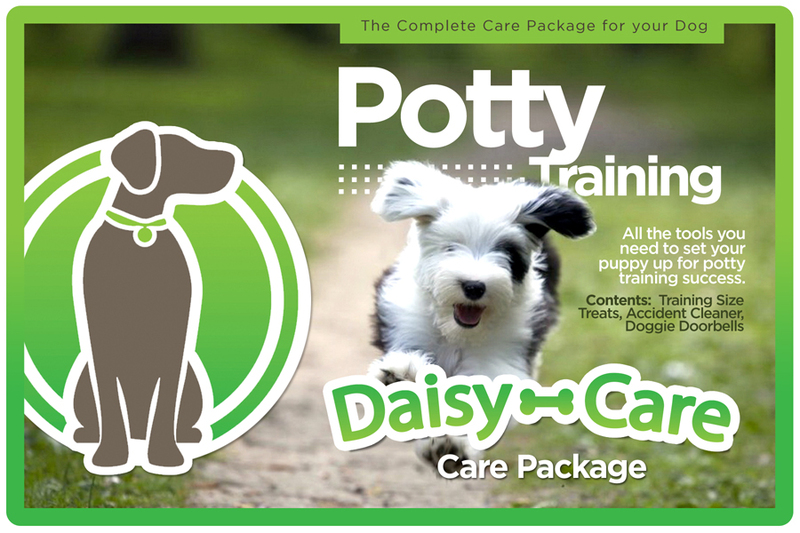 Puppies are a delight but potty training them can be a pain. This care package is designed to provide all the supplies you need to make training a success. Bacon and blueberry training size treats are a perfect reward when your pup goes in the right spot. Made from wholesome ingredients with no grains meaning no stains, smells, grease or crumbs in your pocket. Classic PoochieBells are fashionable as they are useful; hang them on your door and have your dog ring the bells to signal they need outside. The grosgrain ribbon comes with a training instruction tag, that when implemented, is reported a 95 percent success rate. Handmade in the USA. Because accidents happen we also included a bottle of Pup Care. The biodegradable and environmentally friendly formula is designed to break down fats and proteins from stains, dust, mud, body oils and saliva using naturally formulated ENZYME technology. 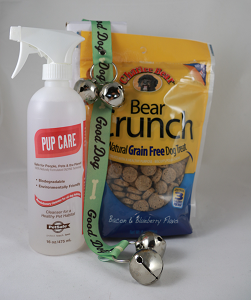 The spray can be used on kennels, dog houses, carriers, cages, bedding, cars and play pens. It is eco-friendly and made in the USA.